ASUS Eee Pad Transformer – ready for media streaming (videos, music, pictures)! At $400, the 16GB, Wi-Fi-only version of the Asus Eee Pad Transformer is the cheapest Honeycomb tablet on the market and undercuts the lowest price iPad 2 by $100. But it seems Asus did not sacrifice features that an Android 3.0 tablet should have. The ASUS Eee Pad Transformer has a speedy Nvidia Tegra 2 processor, good for multitasking, e-mail and calendar notifications. Asus rates the battery life for the Eee Pad Transformer at roughly 9 hours and 15 minutes for mixed use on a full charge. And there are HDMI out for HD video and mirroring. With preloaded streaming app MyNet, the Eee Pad is ready to play streaming media including videos, music and pictures. Streaming technology makes it possible for us to watch movies on Eee Pad Transformer without downloading a copy to the tab. What do I need for streaming 1080p movies to ASUS Eee Pad Transformer? 1. A media server holds video data. 2. When you want to watch a video, you click the right command, like "Play" or "Watch." This sends a message to the server, telling it that you want to watch a certain video. 3. The server responds by sending you the necessary data. It uses streaming media protocols to make sure the data arrives in good condition and with all the pieces in the right order. 4. A plugin or player on your target device to decode and play the video signal. 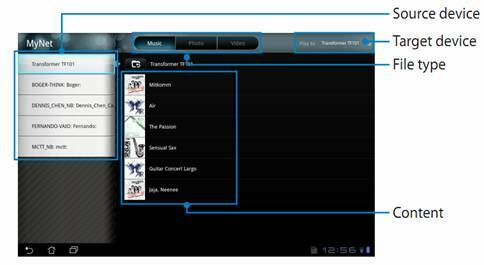 The ASUS Eee Pad Transformer is DLNA-enabled, so you need to put streaming media onto a DLNA-based server. It could be a DLNA-based Windows 7 Desktop, a self-assembly HTPC, Home server or any other DLNA compliant devices. To stream movies to ASUS Eee Pad Transformer smoothly, you need good network condition. If the network conditions don't provide the bandwidth to support the video bit rate setting that you've specified, you'll see the video pause from time to time. A broadband speed of 2.5 Mbps or more is recommended for streaming movies, 10 Mbps for High Definition content. Besides, you also need to have corresponding clients and media streaming apps installed and configured properly before you could use ASUS Eee Pad Transformer to play 1080p movies from media server. 1. Ensure that your Eee Pad and source PC have connected to the same wireless access point. 2. Click and enable Allow remote control of my Player and Automatically devices to play my media in the Media Player on the PC. 1. Start up MyNet, and select your PC on the left (source) and your Eee Pad Transformer on the top right cornner(target). 2. Switch the file type on the top and select the movies you’d like to play. Tip: MyNet only works with Windows Media Player 11 or later version. Sending large amounts of video and audio data over the Internet requires large bandwidths. When network conditions don't provide the bandwidth to support the video bit rate setting that you've specified, it results in choppy playback. Under this circumstance you need to increase the bandwidth or lower the video bitrate. Pavtube Blu-ray Video Converter Ultimate is recommended for you to cut down video bitrate because it not only compresses 1080p movies to lower bitrate with good quality, but also rips copy-protected Blu-ray Discs and DVDs to 1080p movies for home movie sharing. Although the ASUS Eee Pad Transformer plays 1080p movies, it can’t handle high-quality 1080p movies well. When we play local videos of 8mbps or better, the motion becomes choppy on Eee Pad. Again you need to decrease the video bitrate to get smooth playback. Asus Eee Pad Transformer has a 1GB RAM, while 2GB or more of available memory (RAM) is recommended for playing streaming media. That’s to say, Eee Pad’s is not quite good for playing high-definition 1080p contents due to limited RAM. USB adapters make your computer work harder, stealing capacity that's needed for smooth playback of content. Streaming content in HD uses more network capacity than other types of connections and we recommend that you avoid using USB-connected WiFi network adapters.